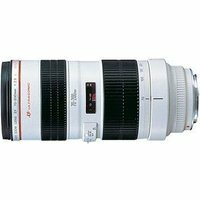 One of the finest telephoto zoom lenses in the EF line, the Canon 70-200mm has 4 UD-glass elements to correct chromatic aberrations. Its constant f/2.8 maximum aperture and superb image quality make it one of the most popular professional SLR lenses in the world. This high-quality, water-resistant lens is compatible with Extender EF 1.4x II and 2x II, and comes with a Canon ET-83 II lens hood.